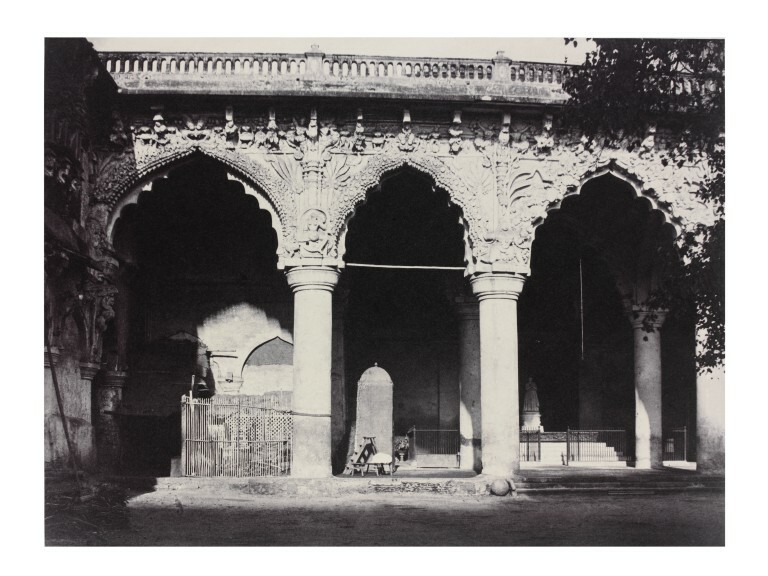 This black and white photograph shows three highly decorated stone arches around what looks like a palace courtyard. The mixture of light and shade highlights the columns, which gleam in the light. This photograph was given by Lady Denison in 1889 during the keepership of Caspar Purdon Clarke, Keeper of the Indian Section of the V&A. It was written off in 1937, and rediscovered and re-evaluated in the 1990s. See Dewan p.471 for listings of other copies elsewhere. This photograph was published as plate V of twenty-three in the album Photographic Views in Tanjore and Trivady 1858, by 'Captain L. Tripe, Government Photographer, with Descriptive Notes by the Rev. G. U. Pope', published in 1860. It was taken as part of Tripe's remit as the government photographer, which he himself defined broadly, as recording, ‘before they disappear’ buildings, sculptures and inscriptions…' including the picturesque. This was a model for an extensive survey, including tuition of others and experimentation in his own practice. He was funded by the Madras government, but intended selling additional copies of some prints so that his practice could be self-funding. Historical significance: Tripe's photographs of South India are an important body of work within Tripe's oeuvre, and are recognised as being some of the most aesthetically and technically competent images of India made in the 19th century. 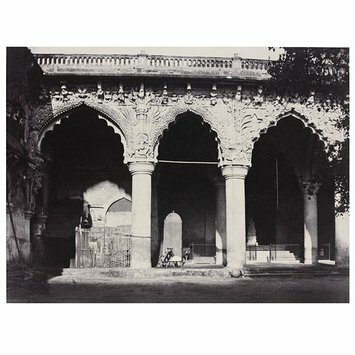 Tripe entered as total of 50 photographs from his 1857–8 tour of South India in the 1859 annual exhibition of the Madras Photographic Society. The jury dubbed his photographs ‘the best in the Exhibition’ but as Tripe could not be classed an amateur, he could not win the gold medal. Tripe declined the silver medal amicably, since he considered that as an official photographer he had an unfair advantage over the other entrants. Tripe’s photographs were valued for their informational value and their technical quality. 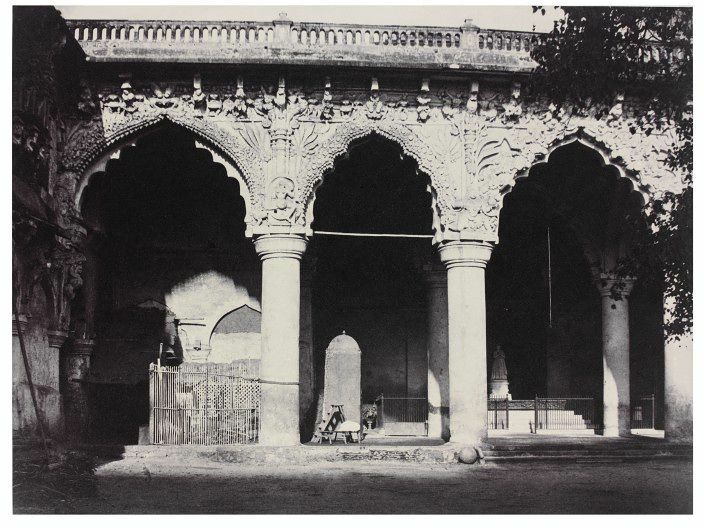 The adjudicating committee stated that Tripe’s photographs ‘illustrate admirably the architecture of the Hindoo Temples and Places of Southern India, and in particular the Madura and Tanjore series comprise in this respect all that is most worthy of record in those cities.’ (See Dewan, p.16). Forty-six of Tripe’s 50 exhibited images were made from paper (calotype) negatives, which the committee didn't feel were as successful as dry collodion-on-glass negatives, however, declaring that ‘the superiority of definition given by Collodion [-on-glass] is very visible when placed side by side with them.’ It is thought that Tripe prefered paper to glass negatives due to paper being easier and safer to work with. The Madras government appointed Tripe as photographer following the 1855 directive from the Court of Directors in London, who discouraged illustration in favour of 'photography as a means by which representations may be obtained of scenes and buildings, with the advantages of perfect accuracy, small expenditure of time, and moderate cash', and asked that photography be the main means of recording architecture and antiquities (Dewan, p.6). As official photographer to the Madras Government, Tripe set off from Bangalore on 14 December 1857 after delays due to waiting for modifications to his new English camera, and his recovery after falling from a horse. He ended his tour in Madras on 30 April 1858 after travelling via Srirangam, Tiruchchirappalli, Madurai, then Pudukkottai, Tanjore, and Tiruchchirappalli again (then called Seeringham, Trichinopoly, Madura, Poodoocottah and Tanjore). All of these areas had been forcefully taken under British rule in the previous one hundred years, but Tripe looked for scenes or subjects with architectural or antiquarian interest rather than political significance. He had wanted to ensure his images were practical too: before he had set out he had asked the chief engineer for guidance on what would be most useful from an engineering perspective, and incorporated this input into his work. Dewan, Janet. The Photographs of Linnaeus Tripe: A Catalogue Raisonné. Toronto: Art Gallery of Ontario, 2003, p.471. Edition number unknown. The album of which this photograph is part was one of between 37 and 40 copies to have been produced. Attribution note: The V&A has another copy of this album (bound) in the National Art Library, pressmark 104.N. The Royal Photographic Society holds the waxed paper negative.